The head is the most important part of the body to protect. In a crash, the head can potentially hit hard structures in the vehicle – like the seatback of the front seat, the window, the door frame, etc – all of which can cause significant injuries to the brain and upper spinal cord. The best way to protect the head is to try and prevent it from hitting anything during the crash. Placing the shoulder belt under the arm leads to an increased risk of head and neck injuries as the head travels farther forward than it would with the shoulder belt properly positioned across the collar bone. These three pictures, taken from a 30mph crash test, show how far forward the head of this 6 year old crash test dummy moves. 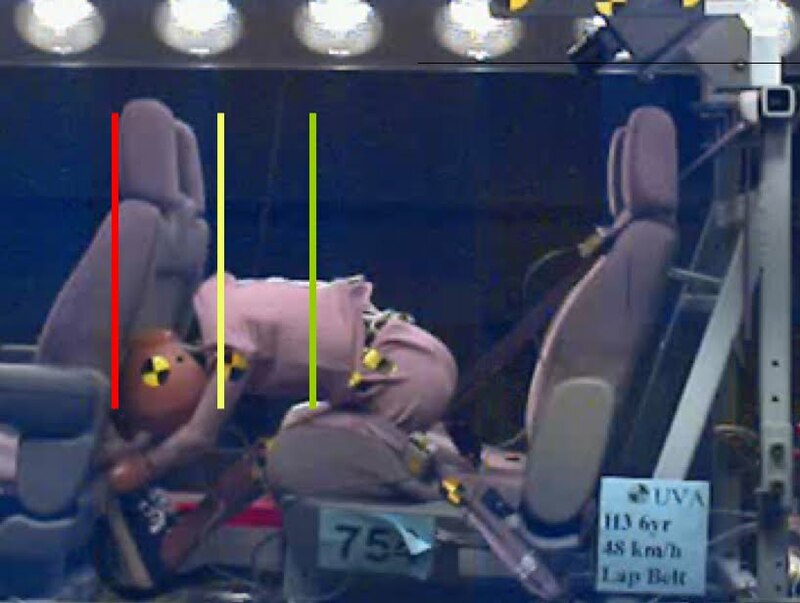 The green line marks the farthest the head moved forward when the dummy was properly restrained in a high back booster. 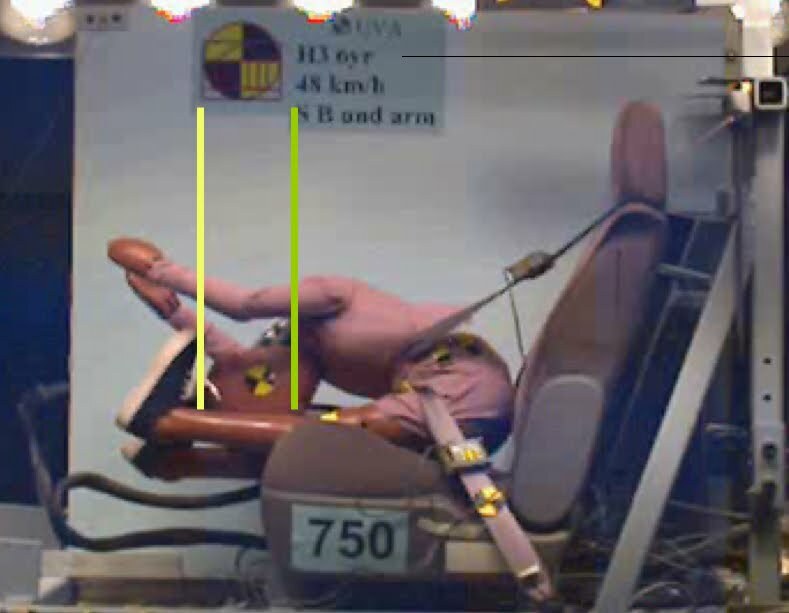 The yellow line marks the farthest the head moved forward when the dummy placed the shoulder belt under its arm (and was not in a booster). The red line marks the farthest the head moved forward when the dummy placed the shoulder belt behind its back (and was not in a booster). 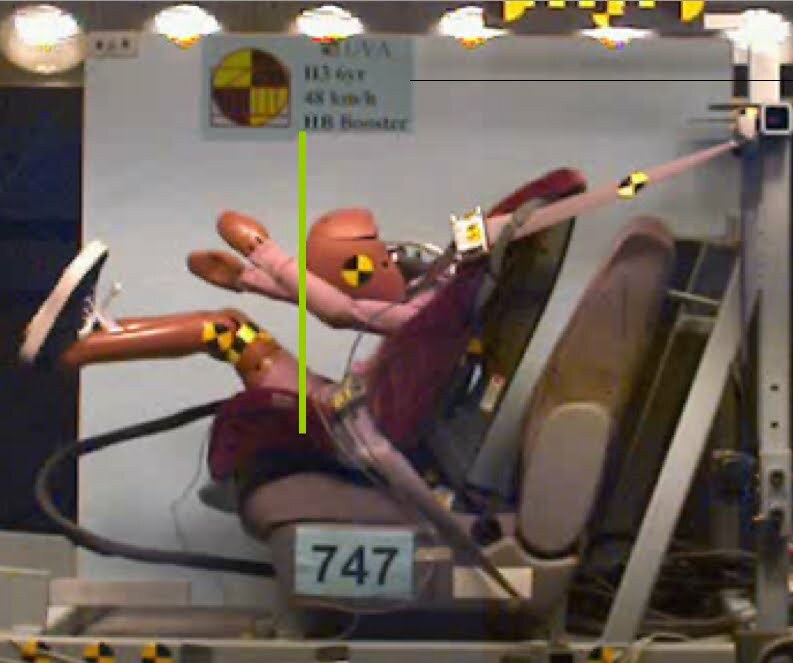 Notice how the dummy’s head strikes the seatback in the third photo – and in a smaller vehicle (or a large vehicle where the driver moves his seat back all the way) the dummy with the shoulder belt under the arm would also hit its head on the seatback. The lap belt is designed to rest on the strong hip bones. The soft belly is not strong enough to withstand the forces of a crash. Should the lap belt slide up over the hip bones and into the soft belly, the lap belt can cut through the belly all the way to the spinal cord causing injuries to the spinal cord and the soft organs in the belly. 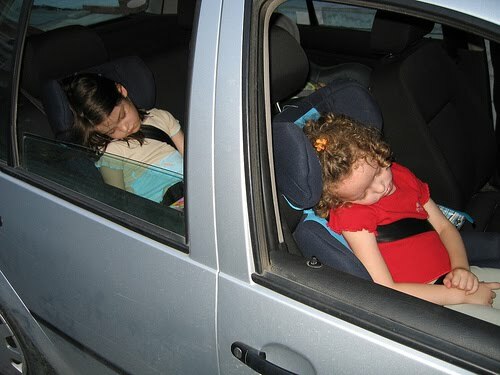 This pattern of injuries is known as “seat belt syndrome” and is seen most often in 4-10 year olds who are not riding in booster seats – although it can be seen in anyone when the lap belt rests on the belly. A shoulder belt that rubs the neck will not injure a child in a crash – but since it is uncomfortable for the child, kids often place the belt under the arm or behind the back. Never allow a child to place the shoulder belt behind the back or under the arm – this only increases the child’s risk of severe head and abdominal injury. A lap belt that rides up into the belly can cause significant injuries to the soft organs in the belly (liver, spleen, bladder, intestines, kidneys) in addition to breaking the lower spinal cord causing paralysis. 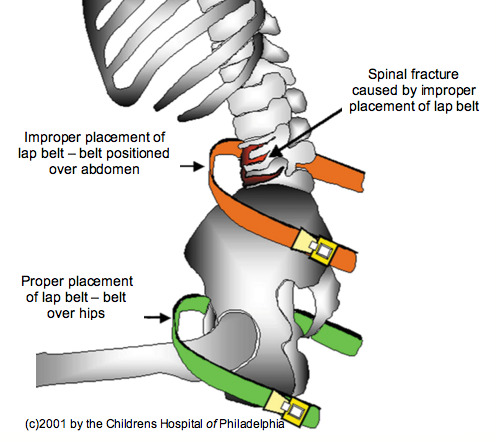 Placing the shoulder belt behind the back or under the arm increases the risk for these belly and spinal cord injuries as without the shoulder belt to properly hold the upper body back, the body naturally folds at the waist (close to the belly button) which allows the lap belt to ride up over the strong hip bones and onto the waist, thus causing injury. Does your child’s booster make the belts fit well? 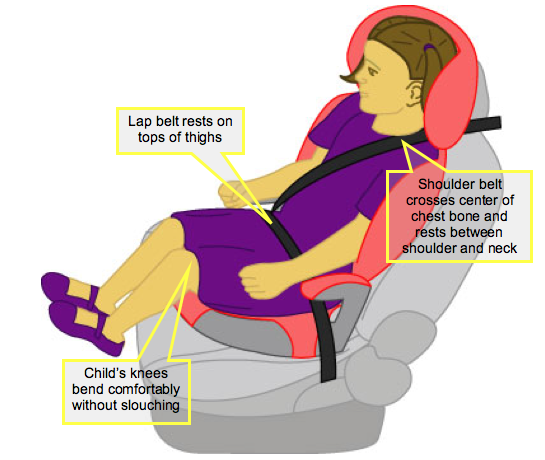 The lap belt should rest low and flat on the tops of the child’s thighs (nowhere near the belly button). The shoulder belt should rest between the neck and the shoulder. Are you a pediatrician or CPS Tech who wants to give a parents some more information on booster seats? Here are several fantastic tip sheets that are free to reproduce. Links will open as a PDF document. “Boosters Are For Big Kids” – This covers the 5-Step Test with pictures showing belt fit with and without booster. Also available in Spanish. Booster Seats and Other Products for Children Over 40 Pounds – Guidelines for size, fit, and usage; list of belt-positioning boosters with weight ranges and features. Also available in Spanish. For Your Family: Belt Positioning Booster Seats. Also available in Spanish. Fotonovella (in Spanish) – designed as an educational tool to promote booster seats among Latino communities. >It's likely, though, that the booster in back is so high on her neck because the shoulder belt is routed over the armrest on that side, not under it.